The Cleveland Browns continued the roster purge on Tuesday, releasing linebacker Chris Gocong and free safety Usama Young. With Young’s release, third-year safety Eric Hagg currently sits at the top of the depth chart at free safety (unless you prefer Tashaun Gibson, that is). At Gocong’s position, the team has undrafted free agents Craig Robertson and L.J. Fort. Luckily, the Browns don’t play a game until September so they have some time to work this all out. Gocong started all but one game in his first five seasons in the NFL (the first three with Philadelphia) before missing all of last season with a torn Achilles tendon. The Browns acquired Gocong in a trade with Philadelphia before the 2010 season. 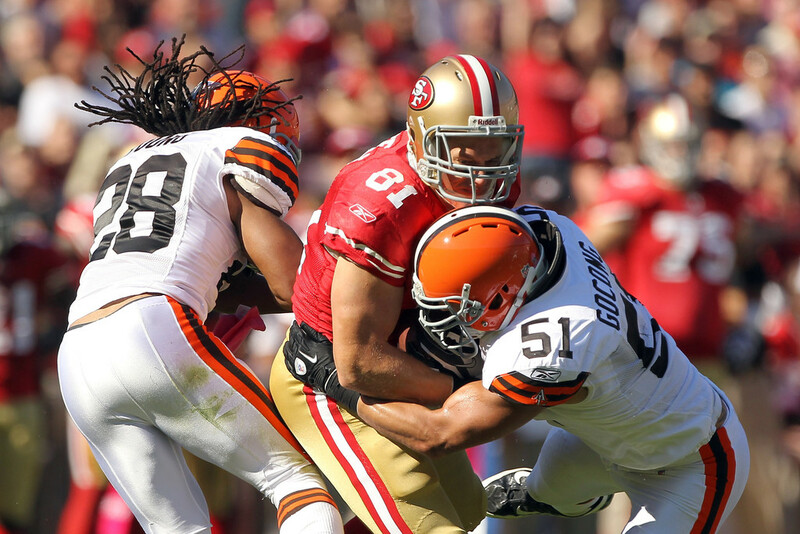 In his two seasons with the Browns, Gocong had 99 tackles and 5.5 sacks. He was set to make $4.45 million in base salary in 2013, which would have made him the ninth-highest paid linebacker in the NFL. Gocong becomes the second former Eagle, following Sheldon Brown, to be shown the door by the man who traded them from Philadelphia – CEO Joe Banner. Young, a seven-year veteran out of Kent State, played 29 games with the Browns after signing with the team as a free agent before the 2011 season. In two seasons in Cleveland, Young had four interceptions and 88 tackles. Young was ranked by Pro Football Focus as one of the undervalued players on the Browns roster based on their Performance Based Value rating. Young had a salary cap number of $1.8 million in 2012 but actually performed like someone who should have been paid $2.9 million (for what it’s worth). Gocong and Young were not the only moves coming out of Berea as the Browns signed free agent kicker Brandon Bogotay. Kidding aside, Bogotay spent a year at a community college in California before matriculating to Georgia, making 15-of-23 field goals. Finally, the team announced that wide receiver Jordan Norwood and long snapper Christian Yount signed their exclusive rights tenders.